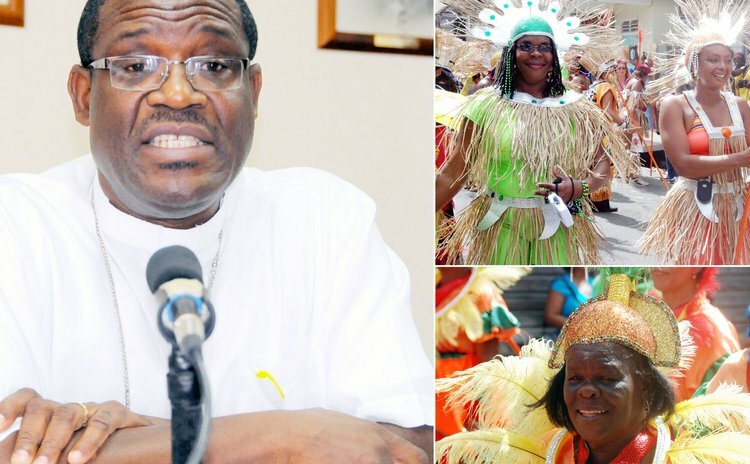 Speaking on behalf of the Dominica Christian Council and the Interdenominational Committee on Crime and Violence (IDCCV) Bishop Gabriel Malzaire today called on carnival revellers to "let rationality and good moral conduct prevail during the festivities." Carnival in Dominica, dubbed the Real Mas, is in high gear at this time. The Miss Dominica Pageant is on tonight; the Calypso Finals is scheduled for Saturday at the Windsor Park Stadium which will be followed by two days of street jump-up. "Carnival time is here again! It is indeed a special time of joy, excitement and pleasure for many of our people. As we all know, there are many positive attributes to this festivity: for example, the opportunity it provides for unleashing the creativity spirit in our people, and the avenue it creates for the much needed catharsis, that is, the letting go of steam, which could have positive effects on the human psyche," Bishop Malzaire said. "However in the midst of these positive attributes, the festivity can be used as an occasion for exercising all forms of licentiousness: drug and alcohol abuse, sexual promiscuity, and the occasion for the incidence crime and violence. Let us remind ourselves that our bodies are temples of the Holy Spirit and they should be treated as such. "During this festive season let rationality and good ethical conduct prevail, for the spiritual, social, and physical well-being of our country. "May The Lord bless all who take part in the activities of the coming days. May their enjoyment lead to greater wholeness, thus rendering our society a kinder and gentler one", he said.